BROC SPROUT 2 is a unique nutraceutical grade whole broccoli sprout capsule that delivers Sulforaphane to your body when swallowed. Every batch manufactured is tested at an independent FDA registered laboratory confirming its Sulforaphane Yield. Made in the USA. 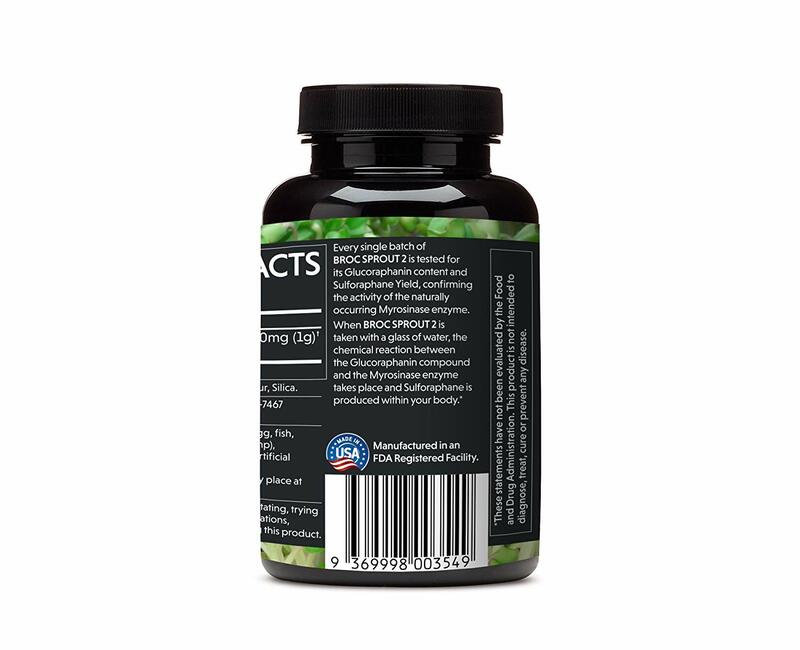 BROC SPROUT 2 is a unique nutraceutical grade Whole Broccoli Sprout Capsule containing the two essential components necessary for the production of Sulforaphane: the naturally occurring Myrosinase enzyme and the Glucoraphanin compound. When you swallow BROC SPROUT 2 capsules the chemical reaction between these two components takes place and Sulforaphane is produced within your body. Sulforaphane is only produced when the key Myrosinase enzyme and Glucoraphanin compound are combined in the presence of moisture (saliva or water) and lasts just minutes once generated. This makes BROC SPROUT 2 capsules the global benchmark for potency and convenience! Beware of products making unsupported claims. Almost every product on the market talks about sulforaphane and the science surrounding it, but does not provide any scientific data confirming its ability to actually deliver sulforaphane to your body. Young Whole Broccoli Sprouts are the most potent natural dietary source of Sulforaphane. BROC SPROUT 2 capsules contain the two essential components necessary for the production of Sulforaphane: the naturally occurring Myrosinase enzyme and the Glucoraphanin compound. When you swallow BROC SPROUT 2 capsules, the chemical reaction between the Glucoraphanin compound and the Myrosinase enzyme takes place and Sulforaphane is produced within your body. BROC SPROUT 2 capsules are unique, as they are made entirely from Young Whole Broccoli Sprouts without herbicides, additives or harmful chemicals of any kind. 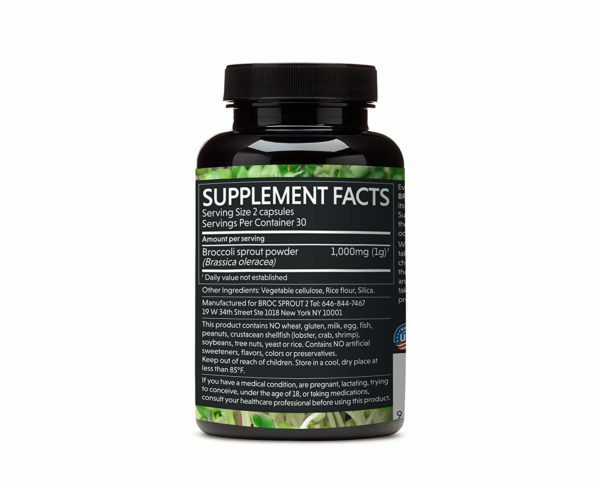 Products must contain BOTH the vital Myrosinase enzyme and the Glucoraphanin compound, in-order for Sulforaphane to be produced within your body. Beware of false claims by other products! Beware Of False Information. There are products currently on the market that claim to produce Sulforaphane, or even claim to contain sulforaphane (sulforaphane is unstable and cannot be stored). Some of these products are branded as ‘extracts’, others are derived from seeds or contain other ingredients; some of these even brand the Glucoraphanin as Sulforaphane Glucosinolate (SGS). Most DO NOT contain the naturally-occurring Myrosinase enzyme. It’s important for consumers to understand that it doesn’t matter how much of the Glucoraphanin compound is present, if a product does not contain the naturally-occurring Myrosinase enzyme, then no sulforaphane can be generated by that product.